Jeremy Cox is Chief Executive of the Association Européenne des Consevatoires, Académies de Musique et Musikhochschulen (AEC). Prior to this, he spent more than ten years as Dean of the Royal College of Music, London. In 2004, he was elected a Fellow of the RCM. Jeremy read Music at Oxford and completed his Doctorate there in 1986. His specialist field is the songs of Francis Poulenc. Alongside his work in a range of Music departments and institutions in Oxford, Manchester and Stirling, Scotland, he has pursued an active career as a singer and conductor. Darla Crispin is a Fellow in Artistic Research at the Orpheus Research Centre in Music (ORCiM), Ghent, Belgium. A Canadian pianist and scholar, she specialises in musical modernity, and especially the Second Viennese School. Darla’s most recent work focuses upon artistic research in music. Her publications include a collaborative volume with Kathleen Coessens and Anne Douglas, The Artistic Turn: A Manifesto (2009) and numerous book chapters and articles. She is currently working on a book entitled The Solo Piano Works of the Second Viennese School: Performance, Ethics and Understanding. What makes a performance persuasive? This deceptively simple question has unresolved resonances that reach back deep into the histories of both rhetoric and philosophy. Even when posed in the more practical context of preparing for an actual musical performance, it immediately raises a raft of secondary questions: persuasive from whose perspective — the composer’s, the performer’s, the listener’s? ; persuasive in what way — reinforcing expectations or transforming them in a revelatory manner? ; and, perhaps most tantalisingly of all, persuasive in what terms — as a satisfying emotional experience, as an exemplar of structural coherence, or as the communicative vehicle for some kind of embodied knowledge or understanding? This list is by no means exhaustive; nor are the categories listed necessarily mutually exclusive. What is immediately clear, though, is that the way in which one conceives of musical persuasiveness will be fundamentally affected by how one views the essential nature of music itself. Above all, it will depend upon whether or not one regards music as having the capacity to carry — and, to the initiated, to convey — meaning. If one does, then the potential scope of a performance’s persuasiveness takes on an altogether broader, deeper and richer character. We must stop seeing it [music] as a linguistic entity and start seeing it, horribile dictu, for what it really is: a product of the arts of decoration. Then the performer is not, by consequence, the slave to the composer’s message but one in whose hands lies the task of presenting, for his or her generation and in the best possible version, this decorative structure. The latter part of this quotation defines rather nicely what one infers that Kivy would regard as a persuasive performance: one that presents, for the performer’s generation, the best possible version of the music’s decorative structure. However, many musicians would surely baulk at the notion of music as being purely — and therefore merely — decorative in its nature and function (hence Kivy’s parentheticalhorribile dictu). Many would also argue that even if one accepts the falsehood of the linguistic analogy of musical meaning, this does not, of itself, invalidate all notions of meaning as they might attach to music. It could also be maintained that musical meaning, whilst it cannot be put into words, and whilst it obeys different structural laws from those of linguistic expression, is not thereby condemned to non-existence. On the contrary, it is precisely because its essential nature is musical, and not linguistic, that it fails these linguistically conditioned tests of validity. To those for whom everything meaningful must always revolve around the terra firma of the Word, they might defend their heretical cosmology of music’s meaning by paraphrasing Galileo with the defiant response: ‘E pur significa’. 1)‘And yet it has meaning’ by analogy with the phrase attributed to Galileo ‘E pur si muove’ (and yet it moves), referring to his belief, in the face of persecution, in the movement of the earth around the sun. A belief in some kind of musical meaning is probably a prerequisite for any kind of serious activity as a performer or composer. However, this belief, when more overtly articulated, lies at the heart of both the philosophy and the practice of Artistic Research in music. Artistic researchers in music are not so much different in this respect from musical practitioners in general. What distinguishes them is the explicitness of the conviction they share that a musical work, whether a new creation or an interpretation of an existing one, has a property of meaning which gives it the capacity to expand or enhance knowledge, insight, and understanding. Moreover, it is this capacity which they endeavour to explore through their experience of the musical work as artists. An artistic researcher would probably not wish to claim that every piece of music, or every performance, holds such meaning in research-significant quantities; neither would he or she regard every serious composer or performer as de facto an artistic researcher in music. However, artistic researchers as a group (if such a homogeneous species can be said to exist) would defend energetically the existence of meaning, whether weak or strong, at music’s core, even while they work to develop and refine the tools and methods appropriate to exploring the kinds of knowledge, insight and understanding which music, at its most intense, can engender. Musical knowledge, insight, and understanding may remain tacit and stubbornly resistant to verbal exegesis but, for artistic researchers, it is axiomatic that meaning does lie embedded in music, and that it is only the currently relatively primitive and puny state of our tools of extraction that limits our capacity to comprehend it. It therefore follows that, for an artistic researcher, a performance will be persuasive, within the terms of artistic research, insofar as it not only carries and conveys musical meaning but, in so doing, enhances knowledge, insight and understanding — no matter how hard it may be to pin down the precise nature of these terms. If such a persuasive performance is of a work that exists a priori in the form of a composition, the artistic researcher will also ascribe musical meaning to the composition itself, and will postulate a relationship between the meaning of the composition and the meaning of the persuasive performance that it has received. This relationship will not be of a straightforward, one-to-one nature because the composition, in addition to its own meaning as a composition, carries a theoretically inexhaustible store of latent meanings that are released by individual performances. The meaning embodied in each performance is both more and less than the meaning(s) encapsulated in the composition: less because it is singular, as opposed to multivalent; and more because it has become fully ‘incarnate’ in the medium of sound and the durational frame of real time. Any persuasive performance of a composition, whether conceived as artistic practice or artistic research, needs to be congruent with the composition in question, as well as coherent in its own terms. If the meaning which it embodies and that residing a priori in the composition diverge too widely it will become, in effect, the performance of a different piece. 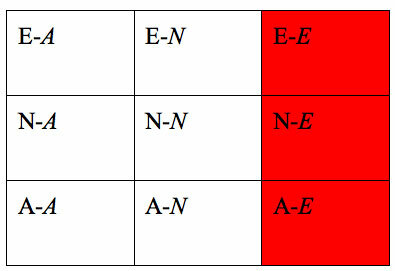 So, whilst a composition and its performance must embody finitely differentiated meanings, they remain meaningfully linked only if the divergence between the two sets of meanings stays inside certain bounds. Within these bounds lies the precious and richly fertile terrain wherein the performer toils to produce a persuasive performance. When, as listeners, we revel in experiencing through a range of subtly different persuasive performances a work which we know and understand well, we are exploring this same terrain, taking in the sudden unexpected vistas that an unfamiliar perspective can afford but, all the time, building the layers of detail that progressively generate our personal and internal ‘map’ of the locale of the work. In our early acquaintance with unfamiliar works, the performer may function as our guide, whereas later, he or she becomes more akin to a fresh companion with whom we re-trace familiar paths. Sometimes we may be charmed to be led on a detour we had previously overlooked, sometimes irritated at the disruption to well-worn patterns and habits that this imposes. We will inevitably come to value some performers more than others and, in returning to them repeatedly, we will develop a similar sense of knowledge and understanding in relation to their musical personalities as we do in relation to the works they perform. At this point, the question of persuasive performance starts to take on an additional and fascinating dimension: that of the extent to which the performer’s contribution as a creative personality in his or her own right confers meaning over and above that which may already be latent in the composition. Clearly, if this additional meaning is incongruent with the work’s latent qualities, the result will be deleterious. But the idea that performance, at its most creative, represents more than merely bringing out one particular configuration of elements all of which were already present in the composition chimes with the reality of the best of our listening experiences. Again, this applies to all artistic practice in music and not just to artistic research. But for an artistic researcher there is something more at stake. That there should be some discernibly novel and unique element conferred by it is central to the belief that performance in-and-of itself can be a form of artistic research. Insofar as one of the prerequisites for research is originality, something of the knowledge and insight imparted by the performer’s act must be truly original, and not merely expert and subtle in its revelation of elements already present, for it to be validated as research in its own right. Figure 1 Kathleen Coessens’ ‘Tacit dimensions of the Musician’s Act’2)Kathleen Coessens presents a more detailed explanation of her model for the web of artistic expertise in an upcoming collection of writings on ‘artistic experimentation’ within the Subseries Orpheus Research Centre in Music (2013–2014). Coessens calls these dimensions tacit because they are present only in the background of the musician’s creative act: they form a ‘web’ of artistic practice, woven and re-woven by the artist over time and in light of new experiences. Her diagram unites philosophical approaches with a model for physical embodiment that, nevertheless, concentrates on the ‘tacit’ world, the world beyond speech. The performer’s engagement with particular ideas, whether verbalised or not, makes subtle changes in the forces acting within this web of artistic practice, and in so doing, has the potential to change the performance itself. The idea of the performer as advocate is not original in itself. Erich Leinsdorf used the concept in the title and content of his book on conducting, The Composer’s Advocate (1981). The conductor, as a special kind of performer, is perhaps more readily accepted than others as having a stake in the original and creative aspects involved in realising a work in sound, time and space. However, the creative input of any performer is potentially the same qualitatively as that of the conductor, though the latter’s must be more patently articulated so as to be communicated to an orchestra. The personality of the interpreter is not necessarily a stumbling block on which the work of art goes to pieces, although in only too many unfortunate cases it may be one; in the good cases which ideally should be the rule, that personality vouchsafes an increment of vitality that is not only desirable, but truly necessary in order to put the message across. What I am claiming is that, by and large, for the most part, we can understand the evaluation of a performance in terms of its presenting, to the highest degree possible, those features of the work performed that tend to make it a good work and presenting, to the lowest degree possible, those that may tend to make it a bad one: in other words, it is the task of the performer, in the words of the song, to accentuate the positive (within the parameters of the work) and eliminate the negative (consistent with work fidelity). So the concept of advocacy encapsulates many of the attributes which we might readily ascribe to persuasive performance. Moreover, although neither Krenek nor Kivy refers to advocacy explicitly, they both imply that the performer-advocate brings something to the table over and above what is already in the work, and that in so doing, is fulfilling, rather than exceeding, his or her brief. The legitimacy or otherwise of this personal intervention is not a matter of principle but of how it is manifested in practice. In Krenek’s ‘good cases which ideally should be the rule’, as in Kivy’s caveats about practice remaining ‘within the parameters of the work’ and ‘consistent with work fidelity’, we see a zone of legitimate intervention opening up within which the performer’s scope for creative originality begins to be defined. Advocacy, in its literal legal sense, comes in many forms, and is highly dependent upon the individual personality and style of the advocate. Nevertheless, one may identify certain general types to which each individual will tend to conform to a greater or lesser extent. Perhaps one of the clearest ways in which this manifests itself is in the degree of demonstrativeness employed by the advocate. An animated and passionate advocate can inspire, although they may also provoke resistance if their manner is perceived as browbeating. On the other hand, quiet understated sobriety can be a powerful tool of advocacy, implying that the arguments speak for themselves without the need for histrionics, although such an approach may run the risk of appearing to lack personal engagement. All these elements have ready counterparts in the sphere of the performer’s musical advocacy, and they form key components of the spectrum-like set of attributes, which, mixing scientific with rhetorical references might be termed the ‘allotropes of advocacy’. 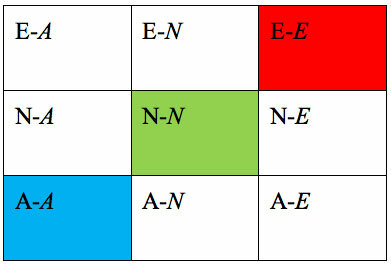 Just as, in chemistry, an element which is allotropic has more than one structural form and, arising out of this, different properties while remaining the same element, so, by analogy, the different forms and consequent properties of musical advocacy may be seen as allotropes of such advocacy. Certain causes are perhaps best suited to certain styles of advocacy and therefore to certain individually talented advocates. At the same time, a professional advocate should have the discriminatory sensitivity to match style to cause and, within certain limits, the versatility to adapt his or her approach accordingly. Again, the same is true of the performer. Similarly, as with legal advocates, some performers may master one approach outstandingly well whilst others make a virtue of their range and adaptability. 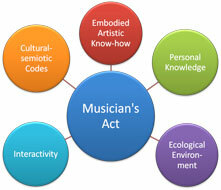 All of these factors are reflected in the model for categorising musical advocacy into its allotropes which we present below. Before doing so, it is perhaps important to underline that the rationalistic epistemology of the proposed model probably renders it irrelevant, or even unhelpful, to the gifted and intuitive performer who wrests a persuasive performance from the musical elements at his or disposal instinctively and by means of a talent honed through years of practice. This is not to say that it may not serve as a tool for others wishing to categorise such quasi-spontaneously persuasive performances, but rather that the very act of self-categorising is alien to the approach of many artists. This is where the somewhat problematic distinction between artistic practitioners and artistic researchers comes to the fore again. In stressing the importance for artistic researchers of probing musical meaning as systematically as the means available to them will allow, it is not intended to imply that other artists are necessarily less concerned with meaning. The difference lies in the manner in which musical meaning is hunted down, and this is why tools — webs, tables, matrices, etc. — are potentially more relevant and helpful to artistic researchers than they are to their more intuitively-minded counterparts. In the descriptions given above, some or all of the characteristics may apply in any given musical situation; equally, there may be other connotations of engagement, neutrality and alienation not addressed here. 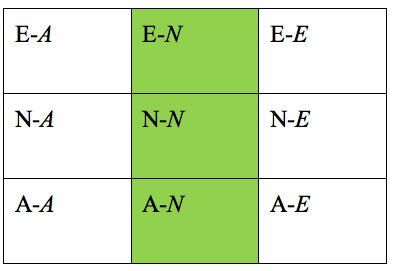 Moreover, engagement, neutrality and alienation, as described here, represent simply the twin extremes and the mid-point of what, in reality, is a spectrum of possible approaches, albeit one across which one may usually detect a prevailing tendency to gravitate towards one of these three nodal points. As stated, the qualities described above may be found, or perceived, in musical works themselves (and therefore be assumed to be symptomatic of the composer’s intention) but may equally well emerge as characteristics of the performer’s interpretation. Accordingly, they are set out in the form of a matrix, with the characteristics of the work on the vertical axis and those of the performance on the horizontal. The design of the matrix offers all permutations of the ways in which the characteristics of the work and those of the performance may interact. 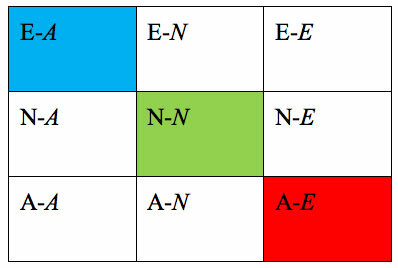 Within each of the nine squares of the matrix, a description is offered of the kind of advocacy strategy, which might give rise to that particular conjunction of work-type and performance approach. It is important to emphasise that all nine of these categories equate to potentially plausible interpretational approaches. 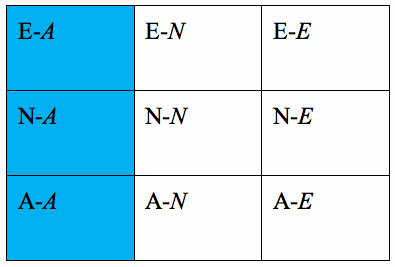 The matrix is not intended as tool for establishing a ‘best’ approach but, on the contrary, as a means both of underlining the multiplicity of forms that a performer’s advocacy may take — hence the allotropic nature of musical advocacy — and of establishing a relatively manageable number of types which can be used as points of reference. The hope is that the performer who is interested in reifying aspects of his or her approach to interpretative advocacy as some kind of working hypothesis or research question (and hence, in moving from the terrain of the artistic practitioner to that of the artistic researcher) will be aided by finding the unique ‘coordinates’ for the approach that apply in their case by testing out where on the matrix they find the strongest sense of correspondence. Taking these nine cases of interaction, a second-order set of five models may be considered, categorizing approaches to advocacy that may be adopted by a given performer across a whole range of repertoire. In the first three cases, the performer presents a consistent ‘persona’ of advocacy. Audiences who identify with that persona thereby gain a reliable conduit to the entire range of repertoire — or at least to that part of it addressed by the performer in question. Unlike these three cases, the fourth and fifth, instead of reflecting a consistent performing persona, embody an approach which is adaptive to the perceived nature of the music and which is modulated accordingly. In these two cases, the relationship between performer and repertoire is dynamic and contingent and audiences are more likely to be drawn initially to the repertoire and only secondarily to its advocate. The nature of the advocacy therefore changes, becoming a phenomenon in which the audience member is already complicit. These cases might be described as contingent advocacies. All of these categories represent descriptions of types of work and performance in terms of their style or manner, and what these outward characteristics seem to tell us about the deeper, innate nature involved in each case. In this sense, they could be applicable even in the context of a conception of music as a purely decorative art form, within which the performer was seeking to present ‘for his or her generation and in the best possible version, this decorative structure’. However, as the earlier discussion shows, the authors’ intention is to offer a frame of reference which may be of relevance to artistic researchers as they attempt to explore, in as rational a way as the medium allows, the embedded meaning of the work and its performance. The point here is that, in the context of tacit and non-linguistic meaning, the medium and the message become even more closely identified with one another than usual (although in a different sense from that which Marshall McLuhan intended by the phrase). Musical meaning, insofar as it may be discussed in words at all, may perhaps best be seen as the expression of itself in terms of what it is. The intimations of embodied meaning that we take from music are gleaned by entering into its nature and understanding it, not cognitively or analytically, but experientially and affectively. We intuit what it is telling us from what it seems to be, not what it seems to be saying — not least because what it seems to be saying is either, at one extreme, the notes and nothing more or, at the other, some fanciful notion of extra-musical equivalences which, much as it pleases many among the music-listening public, is self-evidently a very particular kind of pathetic fallacy. If it is accepted that music’s nature and its meaning, the medium and the message, are closely co-identified in this way, then it will be seen that the proposed model is also a tool for mapping at least the rough coordinates of musical meaning. Moreover, it is a tool which may have relevance for all types of artist-researcher: the composer keen to understand more closely the processes of negotiation whereby his or her intentions may be mediated during their transmission to an audience; the performer wishing to plan and plot the trajectory of his or her interpretational preparation as though it were a research experiment, and thereby to find certain kinds of rationale for interpretational decisions; and the scholar-practitioner wishing to expand the theoretical framework within which artistic research can develop its own distinctive rationales and methodologies. One of the model’s possible uses in artistic experimentation is as a rationalising framework within which alternative interpretational strategies might be deployed and then compared. In particular, it opens up a territory of possibilities for the performer who pursues the goal of an ‘authentic’ performance but who looks beyond the dimension of this represented by faithfulness to the letter of the score. Artistic research that focuses upon the performer’s interpretational choices and seeks to frame these as ‘research questions’ has had to engage with the concept of Werktreue, and with the complex intellectual paraphernalia and extensive literature surrounding it. This is despite the fact that the concept no longer has the universal authority which it once did, and is increasingly seen to be the product and symptom of a particular historical phase in the history of music and musical thought. Ironically, artistic researchers attracted to exploring the ‘truth’, and perhaps especially the ‘morality’, of their interpretational choices are prone either to be drawn back into arguments about work fidelity that focus on the musical text or to be misconstrued as doing so, even when their preoccupation is more with the musical act than with the musical text. Artistic research offers perspectives beyond the horizon-line of textual fidelity but it finds it necessary to gaze out over this heavily scrutinised territory in order to reach these. This is where even an apparently straightforward and mechanistic model, such as that presented here, may have the potential to clarify where the true focus of enquiry lies. Putting down a few cardinal markers around and across the terrain of musical interpretation can encourage genuine and legitimate originality. Rather than simply transmitting what is already inherent and, somehow, fully anticipated within the music, this model seeks to offer both orientation and encouragement to explorers of that terrain. There must always remain a point at which the interpreter, in adding to what is already latent in the music, may be universally felt to have gone ‘too far’. Having some landmarks in the territory beyond slavish Werktreue and before the boundary of excess is of crucial importance — and increasingly so as artistic researchers seek to push out into, and chart more systematically, this domain. The authors hope that the concept of advocacy, and their model of its allotropes presented here, may offer some useful pointers for artistic researchers as they press forward with this exploration. 1. ↑ ‘And yet it has meaning’ by analogy with the phrase attributed to Galileo ‘E pur si muove’ (and yet it moves), referring to his belief, in the face of persecution, in the movement of the earth around the sun. 2. ↑ Kathleen Coessens presents a more detailed explanation of her model for the web of artistic expertise in an upcoming collection of writings on ‘artistic experimentation’ within the Subseries Orpheus Research Centre in Music (2013–2014).